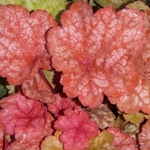 Heuchera 'Heureka Amber Lady' features soft, velvety amber leaves with rose pink undersides. A silver marbling overlay adds beauty and dimension to the lobed foliage. This selection quickly forms a dense healthy mound perfect for containers or to line a walkway. A little direct sunlight deepens the colors. PPAF.